One of the newest food truck in town is called Wing’n It. They specialize in one thing – chicken wings. During our First Look, we enjoyed Buffalo Wings and A.M.W. (apricot, maple, whiskey) wings. You cannot tell from the photo, but these babies were hot, hot hot! The grilled jerk wings were nice and charred, with plenty of that char flavor in each bite. Not only were the jerk wings hot and peppery, but there was plenty of meat on the bones. Chicken wings can be sparse in the meat department, but these were nice and meaty. The mac & cheese was a large portion for only $1.50. If you’re worried about being hungry with only 6 wings, a side order of mac & cheese will make sure you don’t get those rumblings in your belly around 4pm. The mac & cheese was creamy and cheesy, and on the mild side. No strong cheeses or bechamel sauce here. The macaroni wasn’t overcooked, which can be a big problem with mac & cheese sellers. If you only want mac & cheese for lunch, go to the Mac Truck, whose sauce is deeper and more complex. But if you want wings and a side of mac & cheese, Wing’in It is the place to go. You can find Wing’n It on twitter here or on our Mobile Munchies twitter feed. 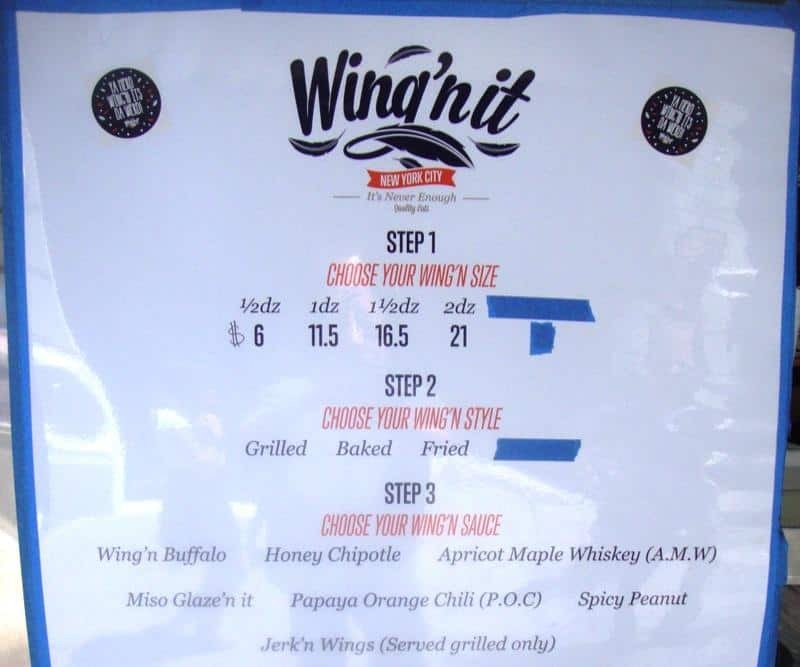 Their facebook is here, and here is the wings portion of the menu. Man, we’re loving this chicken wings truck. Too bad you can’t get an ice cold beer to go with the jerk wings. Previous articleMobile Munchies for Mon, July 29th.